Porto (Portugal) – 95 abstracts received during the Call for Papers reveal the increasing interest of the footwear industry for the UITIC Congress. The 20th edition of the International Technical Footwear Congress will take place in Porto from the 16th to the 18th of May. 19 countries, representing the main worldwide footwear players, have presented their ideas for the in-room sessions of the UITIC Congress. China, India, Italy, Mexico, Portugal and Spain were the most represented countries in this Call for Papers open to all innovators from the worldwide footwear industry. An increasing number of countries with submissions when compared to the previous edition of the Congress (13 countries presented submissions for the last UITIC Congress in Chennai) reveals “the UITIC Congress is more and more interesting for the footwear community”, stated Françoise Nicolas, UITIC’s General Secretary and Coordinator of the Scientific Committee. Nicolas has no doubts: “We can consider the Call for Papers a great success!”. - Human centered factories and new way of management. Anticipating the atmosphere of the 20th UITIC Congress Françoise Nicolas declared: “It will be a great opportunity to meet relevant experts from the main footwear manufacturing areas, to have detailed information on the state of the innovations available and to get familiar with the main technological orientations for the footwear sector. HARARE, November 13 (The Source) – Zimbabwe’s largest retailer, OK Zimbabwe, last week said its internal tracking of inflation showed that inflation stood at 7,69% in September, much higher than the 0,78% given out by the Zimbabwe Statistics Agency (Zimstats), laying bare the difference between official figures and the situation on the ground. OK Zimbabwe calculates its inflation based on the changes in prices of its product range. Its financial results are also reflective of the influence of high inflation. This explains why three main retailers are posting impressive performances relative to regional peers. Three main retailers dominate the Zimbabwean market: OK Zimbabwe, TM Supermarkets and Choppies, all of whom are delivering good value to their shareholders despite a sluggish economy characterised by acute forex challenges and waning aggregate demand among other challenges. The performance, as OK Zimbabwe said, is attributed to the inflationary environment coupled with the use of electronic means of payment as the economy moves to plastic money to counter the prevailing serious cash shortages. The largest retail group, OK Zimbabwe’s net income more than doubled to $5,1 million in the six months to September, from $2,3 million in the comparable period last year on increased revenue and inflationary pricing. Revenue rose 22,6% to $268 million from $218,6 million in the same period last year. Another retailer with operations in Zimbabwe, Choppies, which is listed in Botswana, also said revenue at its Zimbabwe operations grew by 17% in full year ended June despite a sluggish economy underlined by chronic shortages of cash. The growth in revenue was despite a 3% decline in sales over the period, explaining the ‘inflation factor’ which is driving retailers performance in Zimbabwe. Choppies has 32 outlets in Zimbabwe. It operates in South Africa, Kenya, Tanzania and Zambia. South African retailer Pick 'n Pay also echoes the same sentiments on its Zimbabwe operations stressing that its Zimbabwe associate, Pick n Pay TM Supermarkets, boosted the group’s half year revenue. Pick n Pay’s Rest of Africa division increased by 12,6% to R2,3 billion ($170 million) while profit before tax was up 22,3% from R103,7 million ($7,7 million) to R126,8 million ($9,5 million), due to a strong performance from TM Supermarkets. The group’s share of TM’s earnings grew 40,4% on last year to R40 million ($3 million). TM Supermarkets has 56 stores in Zimbabwe, 16 of which trade under the Pick 'n Pay banner. Pick 'n Pay controls 49% of TM , with the remainder held by Meikles. Pick 'n Pay explicitly said that even though its franchise businesses outside South Africa did well in the period, the group’s share of profits of TM Supermarkets (its associate in Zimbabwe), continue to make an outstanding positive growth contribution. Zimbabwe supermarkets operate in a market which is still signiﬁcantly underpenetrated in terms of formal retail but face competition from an explosion in informal commerce. Supermarkets however have an edge over the informal which are predominantly cash based. The cash situation in the country has seen an upsurge in customers bracing to que in formal shops which offer an array of payment options other than cash. However retailers are not immune to the forex challenges facing the economy at large, which constrain their capacity to meet foreign suppliers on time, posing product supply challenges. They however leverage on the support from their parent companies, though not sufficient, to meet consumer demand and provide a wide range of products. 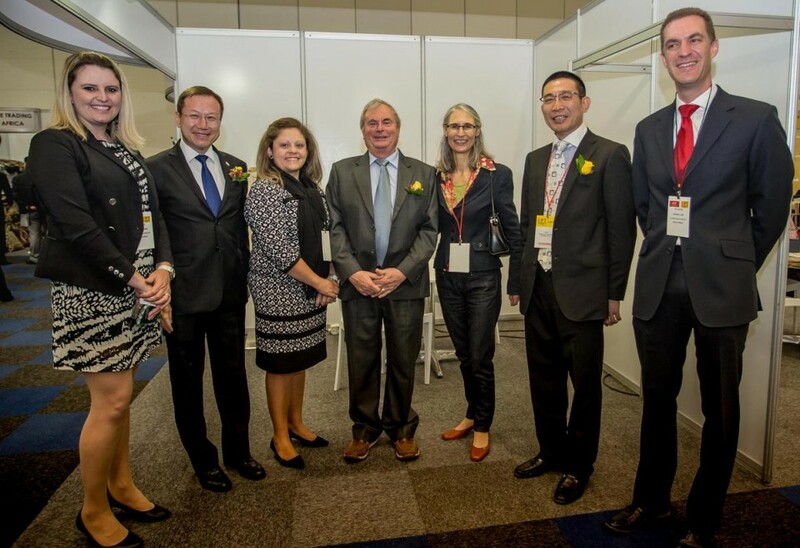 Cape Town, SA - Local fair organiser LTE hosted its last Apparel, Textile & Footwear (ATF) fair, which ran from November 21-23 alongside the China Premium Tex Show. Global fair organiser Messe Frankfurt will run ATF and its sister fair, Source Africa, from next year. CCPIT TEX and United Asia were joint organisers with LTE of the China Premium Tex Show.